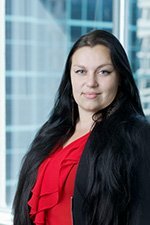 Evgenia joined MBM in January of 2014 as a Marketing Manager and is now spearheading MBM’s Marketing & Business Development strategy. She has extensive experience in all aspects of Marketing and Communications with more than 10 years experience in a variety of industries including technology and professional services sector. In her past roles, in addition to her marketing function, she also developed and taught marketing, communications and social media courses for internal staff and was part of the recruitment and talent management committee. Evgenia has a B.Comm. in Marketing and recently completed her MBA at the University of Ottawa. She specializes in content marketing, digital marketing, social media and event management, but has a passion for the field of Marketing as a whole. She speaks three languages: English, Russian and Hebrew. Evgenia is an avid travel and food enthusiast and enjoys planning her next travel destination and picking the next restaurant to try.